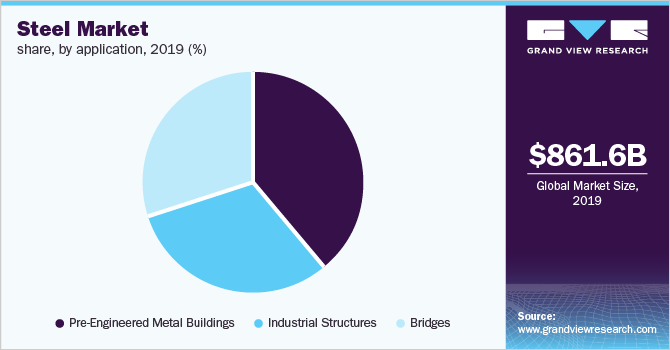 The global steel market is expected to reach USD 1.01 trillion by 2025, according to report by Grand View Research, Inc. Growing inclination of contractors towards sustainable, low cost and durable building materials is driving steel demand in upcoming residential projects & industrial infrastructure. According to a report by Grand View Research, Inc.; the global steel market is anticipated to reach a valuation of USD 1.01 trillion by 2025. Growing requirement for pre-engineered metal buildings and lightweight building materials to foster energy savings is anticipated to propel market over the forecast period (2014 to 2025). Advanced steel products reduce construction costs, enhance consumer safety, and minimize business risks associated with poor welding quality. This factor is anticipated to boost adoption in near future. Continual transition from conventional casting processes to novel technologies using recycled metals can fuel market growth. Growing awareness regarding sustainable manufacturing processes to reduce harmful emissions and wastage can further drive demand. Growth of construction sector in developed economies coupled with increasing number of building permits can augment adoption of steel over the next few years. Technological advancements and R&D activities by manufacturing companies to produce new and innovative products can stimulate market growth during the forecast period. The global steel market is segmented on the basis of product, application, and region. Based on product, the market is categorized into cold rolled, hot rolled, direct rolled, tubes, and other profiles. In 2016, hot rolled steel segment dominated the market with around 75% volume share. The product is increasingly being preferred attributed to relatively more production and exceptional characteristics such as formidability, superior weldability, and high residual strain during baking along with good adhesion ability. Based on application, the market is classified into Pre-engineered Metal Buildings (PMB), bridges, and industrial structures. In 2016, PMB was predicted to remain dominant application with around 40% of volume share. Rising demand for ready-made and hassle free buildings for industrial applications are some of the growth drivers. In addition, rapid rise of industrialization in emerging economies coupled with high awareness regarding lower costs associated with PMB can drive growth of segment. The PMB segment is segmented further into primary and secondary members, panels, and roofs and walls. In 2016, primary members alone accounted for 30% revenue share. Steel panels are likely to witness the fastest CAGR of 8.2% from 2017 to 2025. These panels can be utilized for both residential and non-residential infrastructures attributed to lightweight, ease of installation, and high resistance to adverse climatic conditions such as snow storm and heavy rains. Regional segmentation includes Europe, North America, Asia Pacific, Latin America, and Middle East and Africa. Asia Pacific market for steel is predicted to witness the fastest CAGR of 2.3% in terms of volume over the forecast period. Growth of infrastructure to support increasing population coupled with substantial rise in residential construction projects can fuel regional demand. In addition, rising adoption of lightweight and low-cost building materials among construction companies is likely to push manufacturers to develop new and innovative products. This, in turn can augment market growth in the region during the forecast period. North America and Europe are estimated to grow well over the forecast period attributed to rebound in housing and construction activities in Canada, United States, and France. Latin America and Middle East and Africa are likely to witness substantial growth during the forecast period. High adoption of reserve funds not only in Dubai but entire Middle East is viewed as a vital tool for strategic asset management and protection of real estate as a viable investment. In addition, outlook for steelmakers in Latin America is anticipated to remain positive over the forecast period. These manufacturers have efficient and profitable operations and create significant levels of employment. They do not receive subsidies or other state aids and can operate and compete internationally. Countries such as Peru and Chile remain economic outperformers, overcoming regional obstacles to present significant investment opportunities. These factors are projected to drive regional market in the forthcoming years. Some of the leading companies in the steel market are Emirates Steel, Hamriyah Steel FZC, Al Ghurair Iron & Steel LLC, Solb Steel Company, and Absal Steel. The market is highly competitive attributed to technological developments and entry of new players. In addition, extensive R&D activities for improved product offerings and development of diversified product portfolios can further fuel competition. Increasing focus on digitalization to deal with various challenges is anticipated to create growth opportunities for steelmakers.